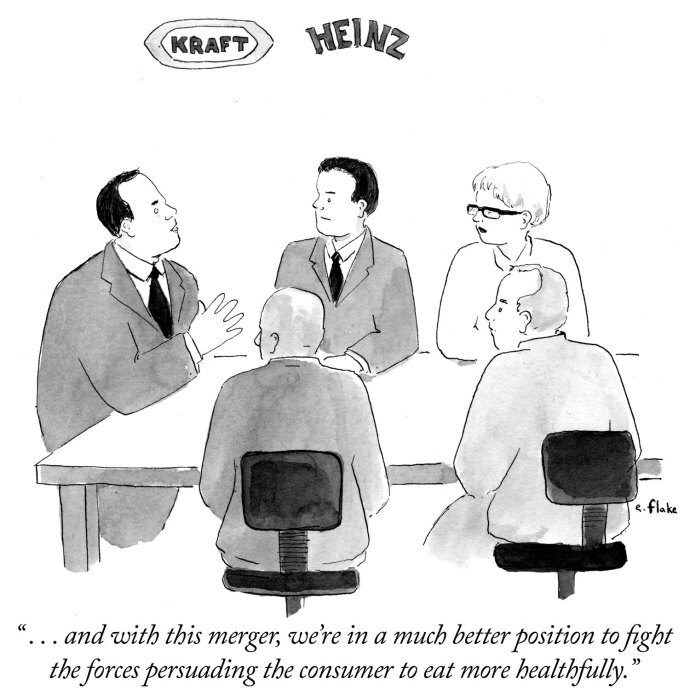 Last month the Heinz Company (ketchup) announced it would be merging with Kraft Foods (mac n’ cheese). Or maybe it was Kraft that made the announcement? It doesn’t matter either way. Could these two iconic brands truly be worried about the growing popularity of raw food diets? Paleo-living? Slow-cooked meals with locally grown produce? Were they fearful that a rising tide of consumer activism — with a keen eye for exposing toxic product ingredients — might do them in? Did they break the news to their respective employees urging them to stand strong in the face of changing tastes — “United we stand, divided we fall”? Probably not. You see, Heinz ketchup is doing just fine. They didn’t NEED to do this deal. Sales aren’t down, in fact sales are BOOMING. Heinz dominates the ketchup market and 60% of its sales come from outside North America. So was it Kraft pushing for the deal? Not necessarily. Regardless of whether America is eating healthier these days, instant macaroni and cheese is still very popular. Kraft owns MULTIPLE brands that do over a billion in sales each year. So what gives? Why would these two companies — who don’t need each other — join forces? The usual culprits certainly: cost savings… spin offs… debt restructuring. But more to the point — OPPORTUNITY. As crazy as it sounds… which is why it will probably work… Warren Buffet (he bought Heinz in 2013) thinks there’s UNTAPPED potential in the middle — literally — of supermarkets and grocery stores all across America. Velveeta Cheese. Miracle Whip. Bagel Bites. Crystal Light. Most analysts and trend spotters would have nothing to do with these items. They’re punch lines on the decline. But Warren Buffet made his fortune zigging while everyone else was zagging. He’s planning on squeezing profits from a rock. Are you gonna bet against him? In today’s unpredictable economy, holding steady just isn’t good enough. If your business isn’t growing in volume… sales… revenue… then perhaps it’s time for a reboot. You don’t have the luxury of watching your business sold off in a hostile takeover spurred on by crotchety billionaire investors. That’s why your products and services have to be fully exploited for maximum sales. Your copy has to be up to the task, ready to stand in for you when you’re not there to address all the questions and concerns your customers have. Let me be frank: most business owners give their customers too much credit when it comes to putting 2 and 2 together. Unless you sell Velveeta, your products and services aren’t 110% self-explanatory. Funny thing is, even Velveeta doesn’t leave ANYTHING to chance. They still spend a fortune on advertising, decades into their history, so that you understand COMPLETELY how and why a cheese-like substance is just as good as cheese. If you’ve never worked with me, you are entitled to a discounted consultation. It’s 30 minutes of intense focus on your business. For most people, that focus is on improving sales copy. Your consult actually starts with a questionnaire I send before we talk. This way, no time is wasted. Your move. See for yourself what it’s all about. Click this link to schedule the consult.